Coongie Lakes is a highly valued, internationally recognised RAMSAR site and Important Bird Area. On the 14-15th September a two-day workshop was held to initiate development of a Strategic Adaptive Management Plan for the area. The workshop was coordinated by Richard Kingsford from the University of NSW, a strong advocate for better management of our river systems and waterbird conservation. Richard made the key point that “We can’t control birds, but we can control habitat to support the birds”. Birds SA was represented by Kate Buckley, who has played a prominent role with the Friends of Innamincka Reserves, and is passionate about conserving the area and it’s wildlife. “Coongie Lakes is a high value wilderness that is recognised internationally and South Australia needs to be vigilant in protecting this jewel”, Kate said. “To protect the biodiversity of the Coongie Lakes we need to reduce the stresses and threats, maintain a functioning ecosystem and especially the natural flow regimes, and plan for climate change, and this formed the basis for the two days of planning and discussion”. The extensive work to date to improve our understanding and protect the Lake Eyre Basin has been widely acclaimed, with The Lake Eyre Basin Rivers Assessment winning the National River Prize in 2014, and the Lake Eyre Basin Partnership winning the Riverprize in the same year. Evidence based decision making meant that the community, pastoralists, governments, conservations, industry and science were recognised with the awarding of this prize. The importance of working together for sustaining people and nature in our large outback areas was recently recognised by a report prepared by Pew, My Country, Our Outback. 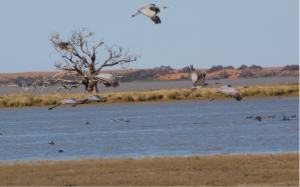 The long list of partners attending the adaptive management workshop demonstrates the collaborative approach to the management of the Lake Eyre Basin. The workshop was attended by pastoralists from both Cordillo and Gidgealpa Stations. Representatives from the Yandruwandha, Yawarrawarrka Peoples provided their cultural perspective to all discussions. The State Government and various Departments were represented as was the Federal Government, Natural Resources and Mines, Queensland, Northern Territory NRM, ANU, University of NSW, South Australian Arid Lands NRM, The Wilderness Society, Nature Conservation Society of South Australia and the Friends of The Innamincka Reserves. Importnantly, three mining companies also attended – Santos, Senex and Beach – each with a large role in managing the area. “Working together and planning for the future is essential. It was recognised that pressure on the security of our food supply will increase and this may lead to the potential for flood plain development up stream of the Coongie Lakes. Any change up-stream has an effect down-stream, and risks to Coongie Lakes through changes in hydrology would be high”, Kate said. Time was devoted to developing a vision for the Coongie area. The conversation will continue in the coming months with all stakeholders to progress the strategic adaptive management plan towards implementation. message – that we can’t control birds, but we can control habitat to support the birds – is important to all members of Birds SA, and the community more widely. If we do not work to protect habitat, we will lose the pleasure of watching birds”.